Congress MP Shashi Tharoor on Sunday praised Prime Minister Narendra Modi but found fault with him and the BJP for being rooted in hostility even while hailing Mahatma Gandhi.Speaking at the Jaipur Literature Festival, writer Tharoor also expressed a desire to introduce the Mahabharata and Ramayana in curricula.The discussion on 'Remembering the Raj' did not necessarily relate to the Modi government.But in the context of Gandhi, Tharoor accused the Bharatiya Janata Party government and its ideological parent Rashtriya Swayamsevak Sangh (RSS) of paying mere lip service to the Father of the Nation.Tharoor was asked by publisher Michael Dwyer to share his perspective on Gandhi's "tricks and tactics". "Gandhiji used tricks and tactics against the British empire that worked because they were obliged to allow Gandhiji to lead the campaign as he wished. It was because there was a moral deficiency in the British and even they knew they were wrong," the Congress leader said. "And what tactics?" Tharoor asked. "The tactics of Mahatma Gandhi were ahimsa and satyagraha. What he did was inflicting pain and suffering upon himself as a response to imperialism. There was not much the British could do anyway. "Shifting the narrative to the contemporary times, Tharoor accused "Modi and his party" of being deeply rooted in hostility. "Modi and his party have been paying tributes to Gandhiji while the history and ideology of the BJP is deeply rooted in hostility. 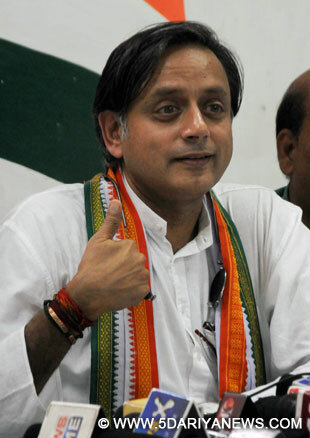 "Everyone wishes to pay lip service to Gandhiji though they are against his principles in reality," Tharoor said as the packed house cheered in approval.He said BJP members were trying to glorify Nathuram Godse, who murdered Gandhi.Tharoor reminded the audience that Mahatma Gandhi and his principles have become "less in substance" today than it should have.Nonetheless, Tharoor praised the Prime Minister for his diplomatic endeavours with Britain since taking power. "I have said earlier too and I will repeat again. The arguments that I put forth in my book ("An Era of Darkness") have nothing to do with the current relations India and Britain share. This should not be the anxiety of the present because we have a booming diplomatic relation," he said.